Let me guess: Your chest routine consists of four sets of flat bench, incline dumbbell presses, and flat flyes. If so, well, you have plenty of company. It’s the same Monday program countless lifters have been following for years without modification. And that’s because it works—to a point. If you’ve hit a training plateau, or if you just can’t remember the last time you shook things up, consider bringing some new stimuli into your chest training. Working the chest muscles with a variety of exercises and angles is the best approach, and these five movements do the job and then some. Your chest is composed of two muscle groups: the large pectoralis major, and the smaller pectoralis minor underneath. The flat, thick pec major originates in a broad sweep along the anterior surface of the clavicle, down the sternum, and from the cartilage of the ribs. It inserts into a much smaller area, the intertubular groove at the top of the humerus (upper arm). The narrow, triangular pec minor originates from the upper and outer surfaces of three ribs and inserts into the coracoid process, a bony protrusion next to the shoulder joint. The pec major is responsible for a number of actions involving the humerus, such as lifting the arm from the side (adduction), from the front (flexion), or turning it in an arm-wrestling motion (internal rotation). The pec minor has one major function, which is to stabilize the scapula. The most popular exercises to add resistance to these basic movements include the bench press, dumbbell press, dumbbell fly, cable crossover, and the push-up. But they’re by no means the only options. Let’s take chest training a step farther and look at more advanced techniques to shock your muscles into growth. If you’re like me and have suffered a torn pec while benching, you’ll agree that the barbell bench press is not ideal for everyone. I also find that my shoulders take over when I’m doing the flat and incline bench, so I prefer to use thedumbbell chest press instead. But I don’t just do any chest press. I add a twist—literally—in order to utilize the benefits of a supine or reverse grip. A study performed in my home town of Toronto determined that when subjects used a supinated grip during an isometric hold of the flat bench press, it resulted in increased activity for the upper portion of the pectoralis major as compared to a regular pronated grip. 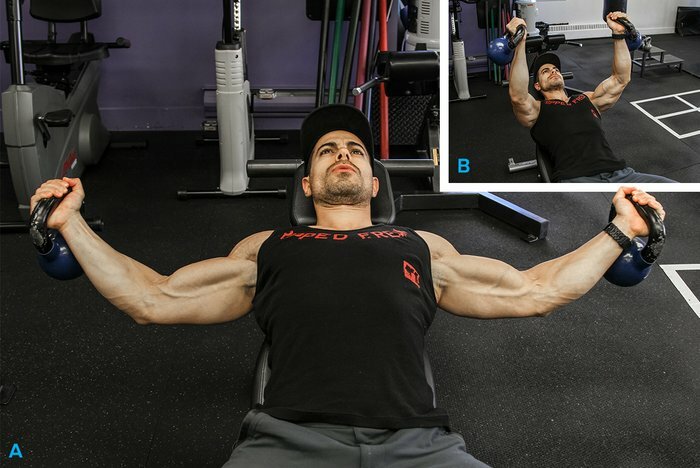 Lie back on a bench holding two dumbbells with a standard grip (palms forward) and arms extended over your chest. Slowly lower the dumbbells to your outer chest, then press and rotate 180 degrees as you push back up to starting position. You should have a supine grip with your pinkies inward and palms facing your face at the top of the movement. 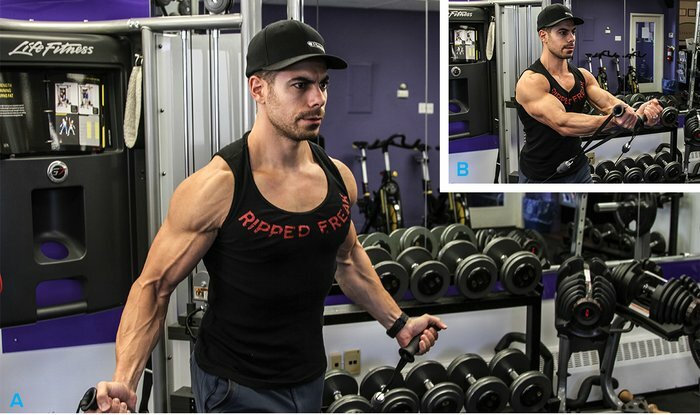 Hold this peak contraction for 2 seconds before lowering into the next rep.
Keep your shoulders back and down during the press to maximize pec involvement and minimize delt takeover. The push-up is a great exercise, but you have to do it a certain way in order to maximize chest activity. 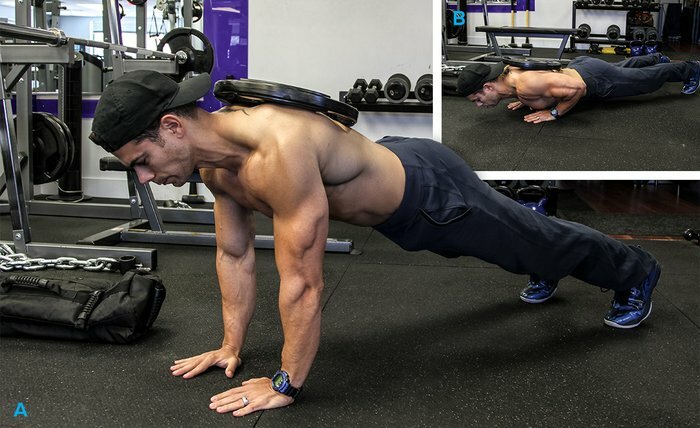 Try using the close-grip weighted push-up as a finishing move after you’re done trashing your chest with the weights. 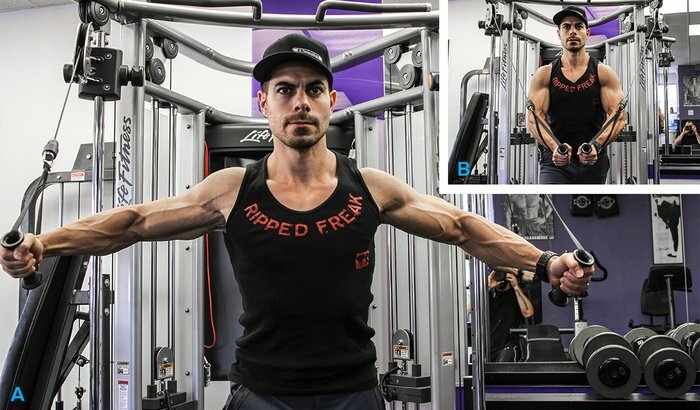 The narrow hand position brings out the inner pecs and the added weight across the back elevates this from an everyday move to a pec destroyer. Back in 2005, researchers at the Mayo Clinic tested 11 men and 29 women to determine the effect of three different hand positions when performing the push-up: shoulder-width, wider, and narrower. The study showed the EMG activity in the pectoralis major was greatest during push-ups with a narrow hand position. Start in a push-up position with your hands about six inches apart. Add resistance by wearing a weighted vest or have a training partner place a weight or sandbag on your back. Slowly lower your chest to the ground and press back up until you fully extend your elbows. Cable work is a great addition to free weights. It provides constant tension throughout the range of motion. But can it match the same level of muscle activation? Perhaps so, according to a recent study sponsored by the American Council on Exercise that investigated the EMG activity of nine common chest exercises. A team of researchers from the University of Wisconsin found that the bent-forward cable crossover produced nearly the same pectoralis major stimulation as the barbell bench press, which was rated the highest. The beauty of the cable crossover is that you can adjust the pulleys to any height you want, which is why I recommend cable crossover 21s. You get the benefit of high, mid-level, and low crossovers in one triset, attacking your chest from all angles. Remember to keep the arms and body stationary so that you perform the exercise from the shoulders. This will help maximize the stretch and contraction of the chest during each rep. Starting with the cables in the lowest position, grab the handles and move into a staggered stance with one foot forward and one foot back. Lean forward slightly from the hip. This is your base position for all three movements. With the handles out at your sides and an underhand grip, squeeze the cables up and in to eye level using a scooping motion. Perform 7 reps in this position. Move the cables to chest height, grab the handles, and get into the base position. Push the handles out and in front of your chest with the palms facing each other. Resist the weight as you open up in a wide arc. Pause when you feel a light stretch in your chest, then squeeze back to the center with the elbows slightly bent and locked in place. Perform 7 reps in this position. Move the cables just above your head, grab the handles, and move back into the base position. Press the handles down and in front of your upper abdominals with palms facing inward. Open your arms back and up until you feel a good stretch across the pecs, pause, and then squeeze back in and under your chest. Perform your last 7 reps in this position. Kettlebells are harder to grip than dumbbells, which makes you work harder for each rep. Using kettlebells for chest flyes will cause your pecs to recruit more muscle fibers to fight the weight hanging below your palms. Start with kettlebells that are 10 pounds lighter than what you would use on a standard dumbbell fly. If you find yourself bending your elbows during the lowering phase, choose a lighter weight to ensure proper form. You want this to be a full-range fly, not a half-fly, half-press. Hold the kettlebells over your chest as you did in the press, but turn your palms to face each other. Using a wide arc from the shoulders, lower your arms with elbows slightly bent until you feel a good stretch across the chest. Pause and contract the pecs against the extra resistance that the kettlebells provide at the bottom range. Squeeze your pecs as you bring your arms back up in a wide hugging motion. Keep your shoulders back and squeeze your pecs together at the top of the motion. The dip is no joke. It’s a tough compound exercise that makes great use of your bodyweight. However, dips are usually performed in an upright position to target the triceps. By simply adding a forward lean to this already-effective exercise, you’ll stimulate more chest activity. You can attempt to do this on your own, but if you really want to get the proper angle you’ll need a training partner to help you get into the right position. You can easily make it more challenging by adding weight via chains or a belt. A word of caution for people with any shoulder issues: Start with a small range of motion and listen to your body to determine how deep you can go. I always advise getting a full range of motion, but not at the risk of injury. Place your hands on the bars and push yourself up until your elbows are locked. Cross your legs back with your knees bent, core tight, and hamstrings and glutes braced. Have your training partner hold and pull your legs back until you’re in a forward leaning position, using just enough assistance to get you into the right angle. Your body should be at approximately a 30-degree angle to the ground. Lower yourself until your shoulders are lower than your elbows, or you feel a good stretch across the chest. Listen to your body and don’t push through shoulder pain. Push yourself up by extending your elbows to 180 degrees for a full range of motion. Visualize the pec squeeze as you drive up. 4 Tips For Staying Fit While Traveling !